Quick indication of dimensions visible for all in production involved people enhance quality awareness, reduce production off times, simplify search for sources of error und provide a quick reaction at production variations. Indicating values visible for everyone with LED-large-displays, that is transparency in production plants. 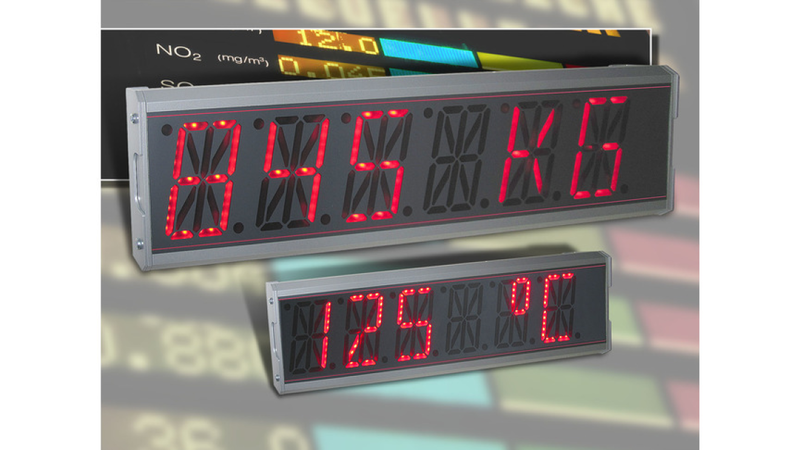 Müller Industrie-Elektronik expands the line of digital indicators with the new LED-large-display SlimLine. It is available with digit height of 57, 100 and 200 millimeter. The clou is the very compact construction in SlimLine-design made out of aluminium extruded section, selectable in colours black, silver, light grey or customized powder coated. There are different variation possibilities of indicating the specific values, for instance, alpha-numeric or indication of digits light writing. The LED-digit colour is selectable between red, green, yellow, blue or white. With protection class IP 67 the LED-large-display is suitable for rough environments, too. With conformable fittings the display can be mounted at wall, into the switch cabinet or as ceiling suspension. It works without optical reflection due to the use of a textured polyester film. The indicated values and the programming are transmitted via Modbus-system/RS485 by default or as an option via radio technology with an optional available communication interface, programmable with a short-stroke keyboard. The interface with 24 V AC/DC is situated in a separate unicase-II-enclosure, that Müller Industrie-Elektronik has developed especially for this application.